Mark your calendars for March 17th-22nd, 2019. VFC will take our annual spring break trip for an entire week on the sand! We'll head down to Laguna Beach, Florida and stay at Laguna Christian Retreat. It's so close to seaside, you can hear the ocean. Do you get excited about a week on the beach?! Well, we do - and VQ is so much more than that! We enjoy playing volleyball, going swimming, singing, hanging out, playing spike ball, feasting (seriously), sitting under teaching, fun with friends, the sun, the ocean, dancing, fireworks, and more! 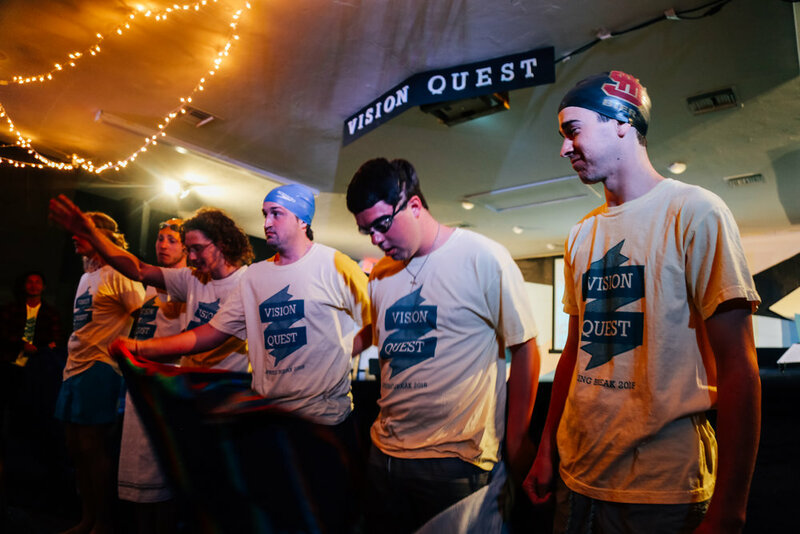 Friendships are made and grown, and some of our favorite and sweetest memories are made at Vision Quest every single year! Ready to Sign Up?! The form is live! Did that price make you do a double take? Don't let the cost of Vision Quest keep you from going! Our church (Cornerstone Church of Knoxville), loves college students so much that they are willing to PAY FOR YOUR ENTIRE TRIP through a program we call "Students for Hire." Students for Hire is designed to allow college students in need to help out families in our church by doing various activities (babysitting, mowing yards, etc.) and then families repay your hard work by covering the cost of your trip. That's how much we value the trip. We are willing to get you there no matter what it takes. Click on the link below if you are interested in signing up for Students for Hire. One of our favorite parts of VQ is the variety show! We encourage all singers, dancers, magicians, actors, spoken word artists, rappers, lip sync-ers, tumblers, and any who have talent to sign-up! You’ll get roughly 3-8 mins to share your gifts with the folks at VQ! It’s the best way to end our week at the beach!